Forum Index > Makers and Manufacturers Talk > any historical sources for viking scabbard reconstruction? Posted: Tue 11 Nov, 2014 11:26 am Post subject: any historical sources for viking scabbard reconstruction? I have decided to post this new topic on viking scabbard here - not in Historical section. because I was looking for some informations and sources about original scabbard in viking age - for reconstruction. the question is - how you making your scabbards? how do you know what they were looks like? I mean - what sources we have for this? I can't promise you it was used by a Viking but this is an actual find that's typical of other scabbards from the era and some art that shows what it would have looked like in life. What you do not find any evidence of is sliders/bridges mounted on the surface of the scabbard. Where they are used in this period, all the evidence points to them being underneath the leather cover. Do you think this is from a change in fashion or rather a function of carrying the sword that became preferred? In other words, a stylistic change, or one brought on by more efficient (or merely different) use and carry? I ask as someone who has not had a scabbard with either strap-slide suspension or "whatever the other kind is called", so I don't know how either feels. Thanks, sorry about the tangent. Maciej, I am sure you will make a very nice scabbard. Please post your results when complete. is there some typology or something about it? - like a period / region styles for example? Matthew -I see that many people are making these wood bridges on viking scabbards. this is good looking element and functional - but how far historical? when we have no evidence - how we can do this in so many styles? BTW - can you say something more about this modern reprod. scabbard from the picture? Do you think this is from a change in fashion or rather a function of carrying the sword that became preferred? In other words, a stylistic change, or one brought on by more efficient (or merely different) use and carry?. Well, it was never the only method, it's important to remember that. I'd guess that it's primarily related to security. A surface mounted slide has to be lashed into place and this is obviously a potential point of failure. Mounting it (or even carving it) in the wooden core and then placing the leather cover over gives added security. From the first appearance of scabbard slides/bridges on the Steppe (at least as early as the 5th century BC) , through the 2nd-5th centuries of Roman usage and onto the early medieval up to the 7th century AD across Western Europe, there are finds of scabbards wirh surface mounted slides which are secured by various methods, including lashing. Materials used varied from elaborate metal and precious stones to carved organic materials. It's hard to define exactly when they stop being surface mounted. The latest English finds are late 6th/early 7th but obviously that has as much to do with the change of burial custom with the adoption of Christianity by the English. 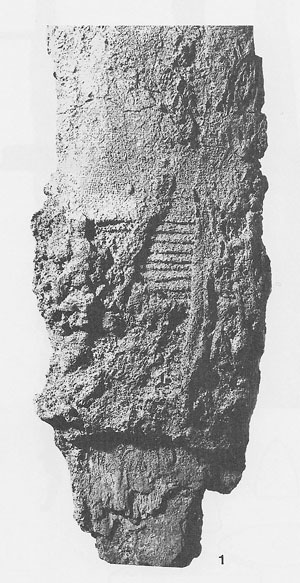 Scabbard remains from the 8th century onward show that the slides were either mounted under the leather or were not used at all. They were never the only means of suspension used. Although I've heard of one example of a 'Viking' era metal slide from Eastern Europe, nobody has ever shown me evidence of the use of surface mounted slides in Western Europe after the 7th century (with plenty of archaeological and pictorial evidence which shows the use of sub-leather sliders) so, based on that, you'd have to conclude that their frequent use by re-enactors portraying that period is anachronistic. 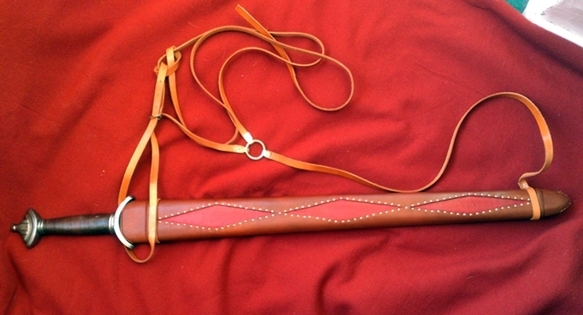 Birch wood core, lined with goatskin. Scabbard cover is based on the Hedeby/Haithabu find which showed that the top layer of leather had diamonds cut out of it to show the leather beneath and that the borders of the cut outs had been edged with pins. No evidence of any scabbard fitttings so I used the Cronk Moar suspension model which leaves no legacy marks if removed. Very interesting,Matthew.Do you have any picture of original Hedeby scabbard? Somewhere, yes. It's in the Von Inga Hagg book on textile finds from Hedeby. The remains are very fragmentary. I'll dig them out for you. I have some news about the viking original scabbards...I will describe and show it soon. Oh dear lord, that site is a christmas present! I was able to find Cameron's Scabbards and Sheaths from Viking and Medieval Dublin hardcover for not so much, but that link is a bookworm's dream. I've worn out two copies of Esther's book on Anglo Saxon sheaths and scabbards. I now have a workshop copy which I've broken down into a binder and an unopened copy which just sits on the shelf being clean and lovely. ... and an unopened copy which just sits on the shelf being clean and lovely. Bad idea. That practice is highly discouraged. Sent that clean copy to me and then you won't have to worry about it anymore. Check out this thread about a Viking scabbard with a slider that was carved into the front scabbard plate. Beautiful and historically-correct! 1. How did we reach the current state where an external (whipped) slider has become so popular yet is not so historically accurate? 2 .The Cronk Moar scabbards found on the Island of Man had a baldric with a 3-way ring suspension instead of a slider. Besides these scabbards, does anyone have any data on other scabbards with such a ring suspension? I think that it was glued on rather than being carved in, otherwise that would be an awful lot of wood to remove from the face. Surviving examples of carved in bridges are much shallower than that. As for the decoration, beautiful yes but historically correct? Not so much. The answer to your first question is, I would imagine, because that's how it was done on some scabbards in earlier centuries. As I've said before, swords of the 6th/7th century often had sliders which were bound to the outside. People saw those, thought "Well, it's all 'Dark Age' so it's fair game" and started using them. I can't think of any similar finds off the top of my head, but there are some interesting PDFs on the Cronk Moar and Ballateare scabbards and their suspension systems here - in particular, Isle of Man Scabbards and Scabbards Type 3c.